Your webpage has 48 'img' tags and 45 of them are missing the required 'alt' attribute. Your webpage is using 194 inline CSS styles! The size of your web page's HTML is 47.33 Kb, and is over the average web page's HTML size of 33 Kb. Your HTML is compressed from 483.46 Kb to 47.33 Kb (90 % size savings). This helps ensure a faster loading web page and improved user experience. Your site loading time is around 7.13 seconds and is over the average loading speed which is 5 seconds. 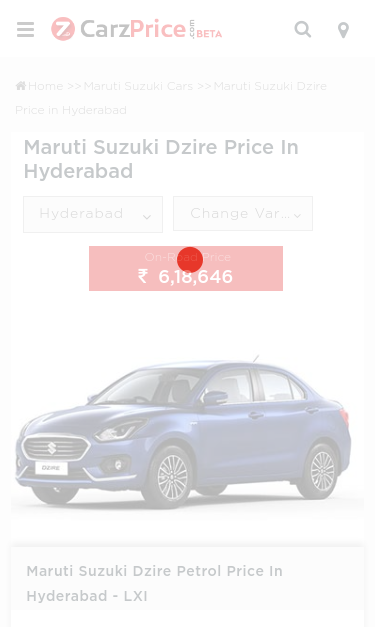 https://carzprice.com/maruti-suzuki/maruti-suzuki-dzire-price-in-hyderabad/dzire and https://www.carzprice.com/maruti-suzuki/maruti-suzuki-dzire-price-in-hyderabad/dzire should resolve to the same URL, but currently do not.